Color: Royal blue - Description: Royal blue sweater, with V neckline and long sleeves; distressed details around the hemline, that to be considered unique features, ribbed cuffs and collar; embroideried cat and mouse, in black, on the back, with the claim "Friends not dinner". This garnment has been realized by Riccardo Comi only for CoccoleBimbi. - Details: 30% Cashmere 70% Lambswool extrafine. Hand wash. 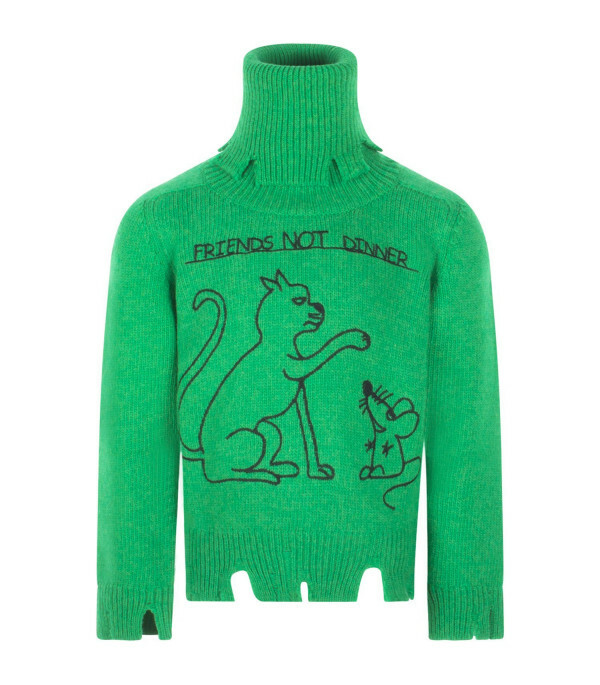 Description: Royal blue sweater, with V neckline and long sleeves; distressed details around the hemline, that to be considered unique features, ribbed cuffs and collar; embroideried cat and mouse, in black, on the back, with the claim "Friends not dinner". This garnment has been realized by Riccardo Comi only for CoccoleBimbi. 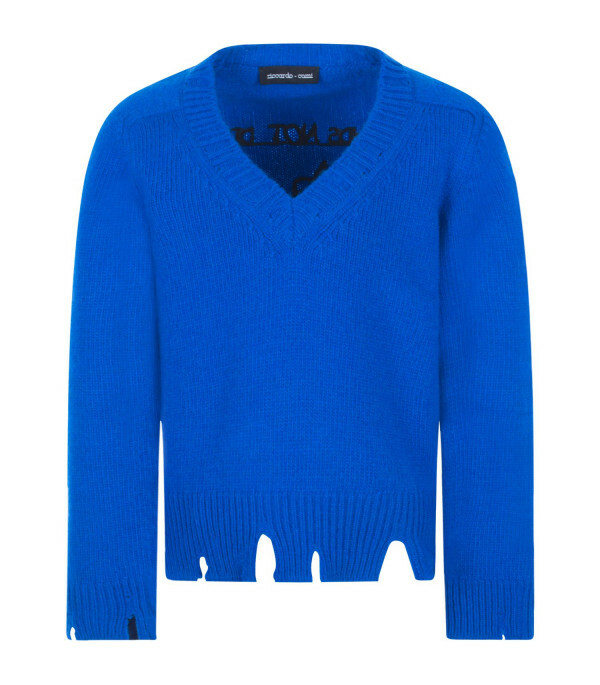 Details: 30%Cashmere 70%Lambswool extrafine. 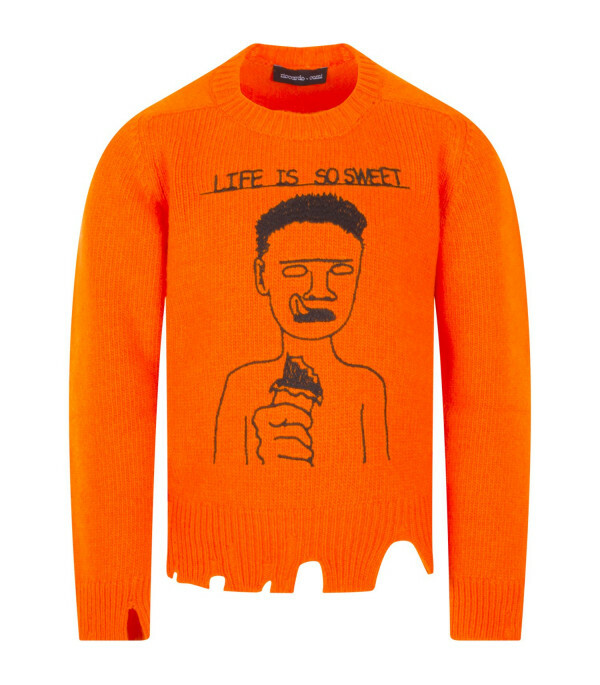 Hand wash.
Riccardo Comi is not only fashion, Riccardo Comi is a world of Art and Grunge Rock contamination. The brand was born in 2013 with the goal to create innovative knitwear, respectful of Made in Italy manifacture and of its noble fabrics. Before a collection of scarves, silk and cashmere with patterns inspirated to street-art; then a luxury street knitwear collection with inspirational elements from skaters’ world, fine yarns, original embroideries. Discover the exclusive collection designed for CoccoleBimbi for boys and girls.